Relatively recently Minecraft introduced cats into the game. 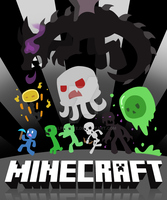 For some reason their special ability is to ward off creepers. 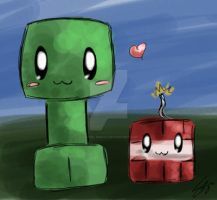 Creeper: AAAH! NO! I'M NOT A SCRATCHING POST! I'm sure you don't need Comments on art this old, but I got sent here and I really hafta say this made me smile. :3 Love that fluffy cat. So THAT'S why creepers are afraid of cats. Ohhhhhhhhhhhhhh.... That's why creepers are scared of cats XD! Cool! 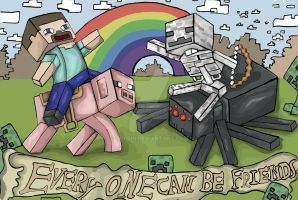 That creeper looks so scared he is like noooo I don't want to get scratched to death. Really funny !!!!! Ha! Ha! Ha! I can see why they scare off the creepahs now! i love Mc and cats!! !